April is supposedly the rainy and cloudy month, but it has been pretty nice so far in my neck of the woods and I am no going to complain. 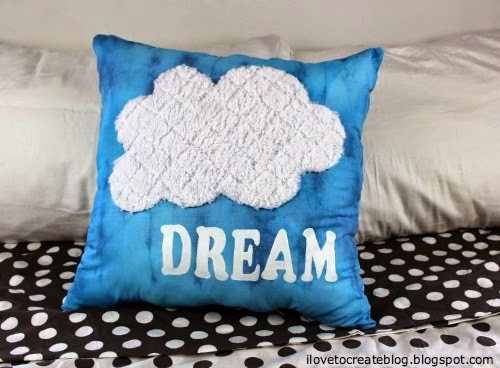 The cloud on the pillow I have created and am sharing with you today is not worth complaining over either. Actually it is quite cute and super soft! Step 1: Tie! 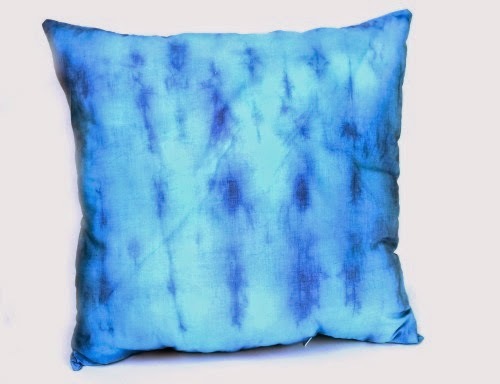 I chose a shibori technique to create the sky background for my pillow. I did this by folding the pillow case case in an accordion fashion and tying it off at about every inch and a half. You could definitely do a different technique like a spiral if you would prefer. Step 2: Dye! 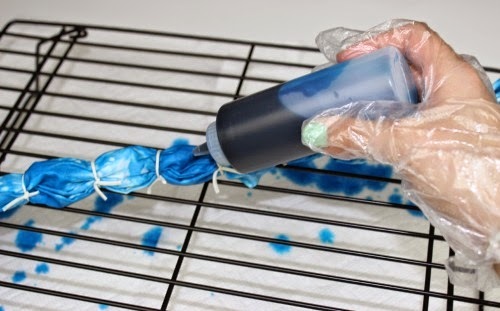 Using the two shades of blue dye, squirt dye over the entire pillow case. The more dye you add, the less white you will see; I added lots of dye because I didn't want any white to show. 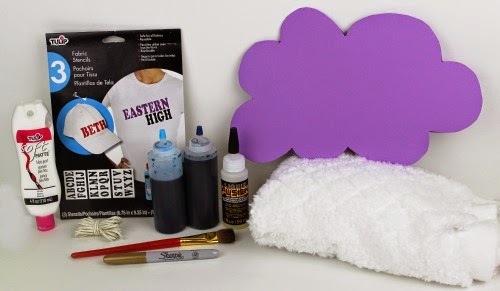 TIP: Place the item you are dyeing over a cookie rack to prevent the mixing of colors. Doesn't it look cool just like this? I still wanted to add the cloud though! 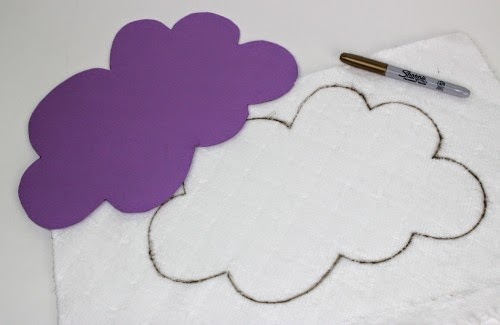 Step 3: Trace your template onto the back of the white plush fabric with a marker. Then cut it out. 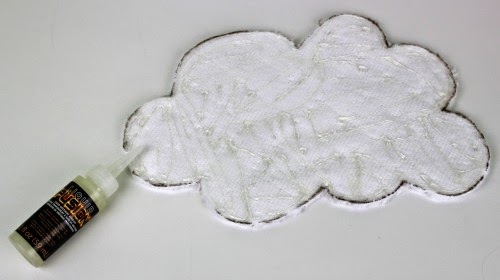 Step 4: Adhere the cloud that you just cut out near the top of the dyed pillow case with Fabric Fusion. Leave approximately 6 inches from the bottom. This will create a permeant bond, so you won't ever have to worry about the it coming loose. Make sure to get the fabric Fusion as close to the edges as you can. 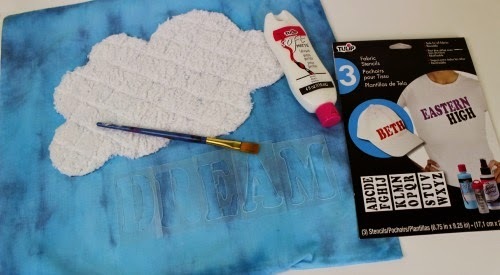 Step 5: Arrange the letter stencils to spell out the word dream below the cloud. I find it easier to cut apart the letters that come on 3 sheets. Then paint in the letters with white fabric paint. And would ya looky there! 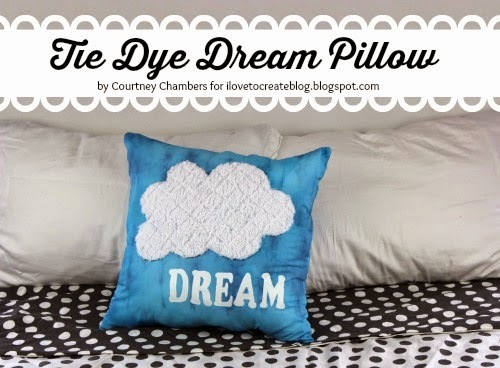 Now you have an awesome new decorative pillow that will serve as the perfect reminder to always dream, because you never know what could happen if you do! Until next time, keep on crafting and dreaming! Great arts. Thanks for sharing your ideas. Keep up the great work & happy blogging!